I get a lot of questions on twitter about what type of face make up I use and I can honestly say I have used MAC Studio Fix powder for the last 5 years and I am slightly obsessed. It is said that this product is a foundation and powder in one but it does not feel like that at all. 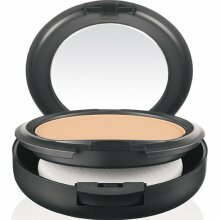 First, it simply feels like a powder but it does give you amazing coverage that is not cakey. It covers ever blemish, mark or blotchy area. I have tried many other powders claiming to be very light but to me even though it gives such great coverage it feels amazingly light! This product provides very long lasting coverage and has a beautiful matte finish. Also, this product comes in a variety of colors to match every skin tone. I use NW30 and for some reason it works for all months even though I am obviously not as tan in the winter. I think I recall the lady at MAC telling me NW was for warmer skin tones. This makeup does not make me breakout whatsoever! Whenever I get my makeup done by professionals this is the powder that they whip out of their makeup case and for obvious reasons, its amazing! One thing to note is that the powder comes with a pad to apply it with. It may provide even more coverage if you use this but I prefer to simply use a brush for a lighter more blended coverage.